The World Health Organization estimates that 347 million people worldwide have diabetes, and that number is expected to continue increasing as more people move to urban cities and the population ages. Low and middle-income countries, like China and India, have been hit hardest with this disease and other NCDs. In 2010, the total number of people with type 2 diabetes was over 90 million in China, the country with the most diabetics worldwide. George Clinical (GC) recently collaborated with a global pharmaceutical in the development of a sodium-glucose co-transporter 2 (SGLT2) inhibitor for the treatment of patients with type 2 diabetes mellitus (T2DM). In China, the GC team made outstanding achievements to project timelines. As regulatory approval in China are typically lengthy, the GC China team made extensive preparations for study start up whilst waiting for regulatory approval. To this end, the China team was able to make the first Ethics Committee (EC) submission on the same day that CFDA approval was obtained. Furthermore, the first EC approval was obtained within 11 days, as opposed to the typical timeline of two months. In total, 26 EC submissions were performed in less than 2 months. In order to reduce site start up time, George Clinical also negotiated with sites to commence contract negotiation before EC approval was obtained. Eight of 26 sites identified were willing to do this, which greatly reduced the overall site start up timelines. As a result, the first contract was signed 2 weeks after the contract template was made available by the sponsor. In the end, 7 sites were contracted as the global recruitment had exceeded expectations due to a lower screen failure rate. The last contract was signed 5 weeks after the contract template was made available. As soon as the contract template was made available, the GC team worked with sites to pre-screen patients so that recruitment can begin as soon as sites were initiated. Within five days of the first contract signed, GC China conducted the first site initiation visit and a day later, screened the first patient in China. In one month from the first patient in date, the China team enrolled 118 subjects and randomized 92 subjects over 7 sites. 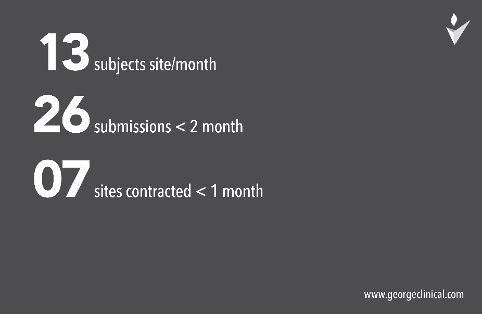 This translates to an average randomization rate of over 13 subjects per site per month. The GC China team were able to deliver these metrics through excellent preparation that was performed whilst waiting for CFDA approval in order to reduce study start up timelines. Through GC’s extensive diabetes network in China, we were also able to identify the best sites with outstanding performance metrics. Site readiness was also increased by setting up the patient pool and pre-screening process early. Communication was of course key, with good communication pathways established early on between the sponsor, GC’s project manager, GC’s CRAs and the sites. The high level of site interaction and cooperation experienced in this study was made possible through the leadership of the Principal Investigator, Professor Bruce Neal. Bruce’s leadership extended from study design to study delivery where GC’s scientific leaders chaired the Investigator Meeting and held important ‘physician–to-physician’ forums to actively engage Investigators during the critical early stages of the study. Engagement with Investigators and their site staff is also facilitated through the appointment and engagement of a National Leaders who perform individual site calls and review performance metrics with sites, and chair meetings to share discussions on scientific data. George Clinical has been conducting trials in China for over seven years and has a major offices in Beijing and Shanghai, along with home based personnel in other provinces. George Clinical China provides full, in-country, clinical trial management services. We pride ourselves in cost effective and flexible service offerings that suit both domestic and global pharmaceutical companies. Our extensive network consists of over 260 trial centers in 50 cities for Phase II-IV trials, and a wider network that includes community health centers in semi-urban and rural areas for Phase IV trials.